As we approach the time of the year that is solely dedicated to huge budget blockbusters and animated talking animals, it becomes increasingly harder to find a film that I really want to see at the cinema. Thankfully, amidst the hairy apes and shiny Transformers is a science fiction film whose trailer pricked my interest. Like many people between the ages of twenty and thirty, E.T. sits proudly on the list of my very favourite movies of all time, and what caught my attention when it came to Earth To Echo was the less than subtle similarities that the two films appeared to share. So, fighting past the throngs of summer holiday Michael Bay fans, I made my way in to an empty auditorium with the hope of having an enjoyable, nostalgic time. 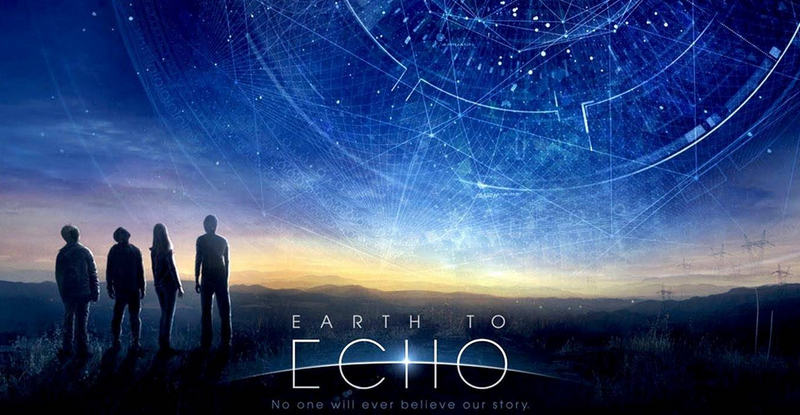 Earth To Echo tells the story of a group of young teenage friends who follow a technology ridden trail to the discovery of a robotic alien life form who has crash landed in the Nevada desert. With the help of their mobile phones, the group then spend a tense night travelling the state in order to find parts of ‘Echo’s’ spaceship in order for him to fly home. Of course, these things are never easy, and the children face a mighty obstacle in the form of a mystery agency who have alternative interests in Echo and are tracking them down every step of the way. What strikes me most when contemplating the film is that it is without doubt targeting a specific demographic rather than looking for cross generational appeal. The science fiction elements of the plot are extremely basic, with maps suddenly appearing on smartphone screens with little to no explanation, clearly images and devices that younger audience members will instantly understand. This is not to say, however, that this basic take on certain elements is detrimental to the film, instead it gives it the freedom to invest in character development and emotional strength. 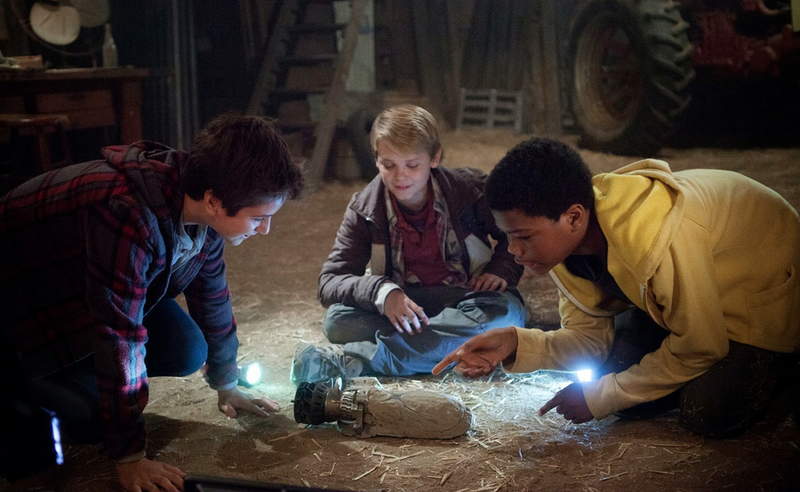 Earth To Echo can be described as a combination Super 8, Stand By Me, The Goonies and E.T., which means that you do indeed feel a certain comfortable and pleasing nostalgia, but it also means that the film has very little to offer in terms of originality. The key themes of growing up, friendship and resilience combined with science fiction narrative is a well worn cinematic area, and while Earth To Echo plays rather safe in terms of bringing anything new to the party, it is an enjoyable ninety minutes of cinema that, whilst absolutely aimed at a younger demographic, has enough heart and integrity to satisfy an older audience. The one spark of originality that the film does possess is the way in which it is presented on screen. The picture is displayed to the audience under the guise of ‘footage’ filmed by one of the film’s protagonists, the tech savvy aspiring filmmaker Tuck (Brian ‘Astro’ Bradley), and on the whole this technique works very well and helps to immerse the audience in to the action, giving the film a rather intimate feel whilst still impressing on the larger action sequences. In any film that heavily features a cast of young leading characters, the quality of actors chosen is arguably the most important element in the filmmaking process. The three young actors at the heart of Earth To Echo are all engaging and endearing screen presences who are individually different and relatable. Brian ‘Astro’ Bradley as Tuck is full of teenage bravado and is the ring leader of the group, giving a cocky but assured performance. Teo Halm as Alex is the quiet foster child with hidden depth and untapped strength, and though his familial background comes across as a touch at certain points in the narrative, Halm is a charismatic presence and the ‘outsider’ bond his character creates with Echo is touching if not a little heavy handed at times. The real star of the show in my mind, though, is Reese Hartwig as Munch. Munch embodies the geeky, self conscious, worrisome type of character that we are used to seeing in a stereotypical ‘group of boys’ dynamic, and it always a satisfying journey to watch such a character come out of their shell and find an inner strength that they did not know they had. Hartwig possesses the right combination of innocence and vulnerability to portray Munch in the perfect way, and much of the film’s comic relief flows through him without turning him in to a clownish sidekick to the more brooding and serious Tuck and Alex. Ella Wahlestedt makes a brief appearance as Emma, a female school friend who muscles in on the alien action, and though the part is acted perfectly well, in truth it feels like the filmmakers suddenly panicked about the overwhelming ‘boy feel’ of the picture and added in a girl to appeal to the female audience. There was absolutely no need for this as the three leading males gave endearing performances for both sexes to become invested in. Overall, Earth To Echo is a tight and enjoyable science fiction film that, whilst obviously targeted at a young audience, is a worth while watch for any age group. Adult viewers will make unavoidable comparisons to better films like E.T. and Stand By Me, but Earth To Echo is a worthy companion piece that invests in strength of character over technical sci-fi conventions. At just over ninety minutes, it certainly doesn’t overstay its welcome and whilst it is not the most original or mentally challenging alien film you will ever see, it has a certain charm that will make you smile and leave you satisfied.